What Exactly Does Twitter Want Us To Fly To? Earlier this year, Twitter got into the event business for the first time with Chirp, a developers conference they put on in San Francisco with the help of Carsonified. Obviously, they’ll be doing another one of those next year. But has the one event caused an itch around Twitter that only more events can scratch? 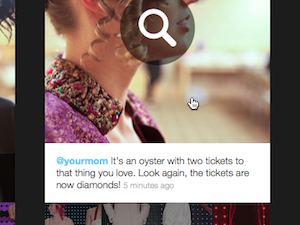 A mockup of a new site indicates that may be the case, but Twitter says no. Mark Otto is one of Twitter’s UI designers. He’s very good. How do I know? Because he shares some of his work on Dribble. Something that he shared about two weeks ago is particularly interesting. It’s a portion of a new site he’s working on for Twitter that looks like it is based around some sort of event, or series of events. Otto is obviously smart enough not to show the whole site, but he does give a taste of what’s to come. The image he shared has the title “Need a Flight?,” and that echoes the banner at the top of the page he’s created. 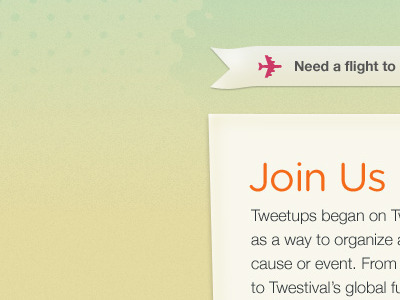 Also shown are the words “Join Us.” Below that, the text is partially cut-off but it talks about the origin of tweetups (Twitter meetups) and also talks about Twestival, the fundraising events that rely on Twitter. Might Twitter be preparing to launch its own foray into these types of events? Okay, so what on Earth is it? What are we all supposed to fly to in order to join Twitter somewhere? With projects like Hope140, and their Fledgling wine label to benefit Room to Read, Twitter clearly enjoys giving back by way of charitable work around the world. It wouldn’t be surprising at all if they started to use their massive social graph to organize events (charitable and otherwise) worldwide. But maybe this is just a mockup of something Twitter is toying around with and doesn’t intend to launch — at least not yet? That said, another couple of mockups Otto shared a week before the aforementioned one point to a “potential new site” that also may be involved in all of this. He seems to be working on the schedule area of the site (which also points to events), but he indicates in his comments that the schedule part may not get made. He does say that it’s unrelated to Chirp though. 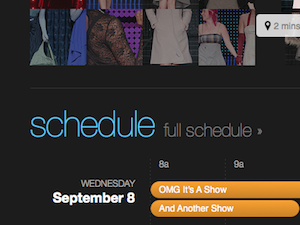 Oddly, from the pictures, it sort of looks like a fashion show site — but who knows, these are just mockups.